CREATE SOMETHING THEY WILL LOVE! We produce quality ingredients for traditional West African meals. West African cooking is a tradition—and a flavor—all its own. Experiencing these traditional recipes, enjoyed the world over and passed down from generation to generation, reminds us of family like nothing else can. From red palm oil to plantain FUFU to pounded yam, Golden Tropics provides the authentic, high quality ingredients that inspire home cooked meals that bring together West African families everywhere–and we are proud to be a part of that experience. Golden Cubes, by Golden Tropics. 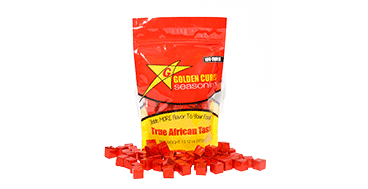 Golden Cubes is our interpretation of what a seasoning cube should be. Rich and bold flavors- the True African Taste. We took great pride in developing this new product, using quality and fresh ingredients. Give it a try! 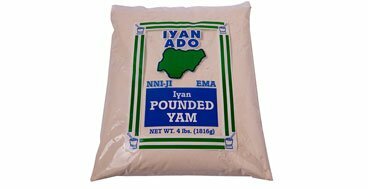 Iyan Ado Pounded Yam is an all natural yam based flour used in traditional African cuisine. Pounded yam (fufu) can be used in a variety of ways, but it’s most popular preparation is a delicious dough, traditionally accompanied by a soup or stews. 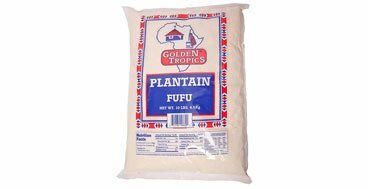 Similar to the Pounded Yam, Plantain Fufu is an all natural Plantain based flour used in traditional African cuisine. Plantain Fufu has many different applications, but it’s most popular is a doughlike preparation made to go with soups or stews. Gari is a popular West African starchy food, traditionally made from cassava grits. 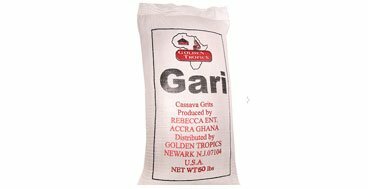 Golden Tropics Gari is a creamy-white, granular flour made from the fresh cassava and finest ingredients. Golden Tropics is a family company committed to providing you and your customers with the finest quality ingredients available to create West African and Caribbean meals. With one of the widest product ranges of any company in the US, Golden Tropics is a leader in the West African food market.